You can store your belongings in almost anything. Plastic bins with lids come in handy to keep things organized and secured, whereas bags are useful for storing bedding and old clothes. Every storage container serves a purpose, and Triple AAA Storage is here with tips on how to make the most of them as you store your things in West Monroe, LA. Cardboard storage boxes are easy to unfold and come in different sizes to accommodate everything from a few office supplies to seasonal decorations. Many people use storage boxes for storing books, electronics, pants, and kitchen items like boxed and bagged goods. When to Use Them: Use cardboard boxes when you want more storage space for the money. They’re perfect for storing almost anything, but they’re not always the most protective storage options out there. Storage bins are made of plastic and come with lids to protect your items from falling out during a move. They’re also easy to stack and have handles for conveniently transporting your items from one place to another. 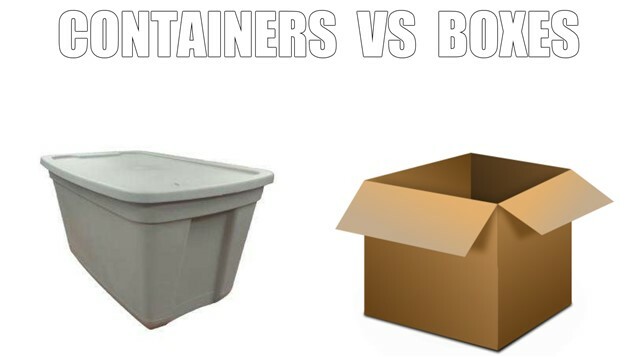 They come in different sizes and are more durable compared to cardboard storage boxes. When to Use Them: Use storage bins when you want added protection for breakables like dishware and picture frames. They’re easy to move and stack thanks to their built-in handles. Storage bags are made from plastic and other materials like cotton and polyester. Vacuum storage bags are commonly used for storing clothes and other garments, keeping things airtight and safe from moisture. When to Use Them: Use storage bags for storing seasonal clothing, bedding, and towels. Consider buying hanging storage bags for keeping your suits or dresses protected and free of wrinkles. Whether you’re moving to West Monroe, LA or creating more space at home, Triple AAA Storage wants to help make it happen. Our storage units give you extra space for storing and organizing all of your boxes, bins, and bags in one place. You’ll have 24-hour access to your unit whenever you need anything, and your storage unit will always be there whenever you need to make room at home for other things.